Where can I buy spectator tickets for the 2019 Turkey Run? General admission tickets are available online two months before the event or at the speedway during show days. Spectator admission for the Spring Show is $10/day Fri and Sat, $5 Sun. Admission for the Fall Show is $15/day Thurs-Sat, $10 Sunday. Children 11 and under free. Are Turkey Run events held anywhere else but the Speedway and One Daytona? No, there are no Turkey Run events held anywhere but the Daytona International Speedway and One Daytona. Both during the day and at night. This is a large event and other promoters, hotels, bars, time share resorts, etc. may sponsor auto-themed festivities. They may be called Turkey Trots, Turketfests, TurkeyCruises or whatever. They are not associated with the Turkey Run. Most of these promoters are fine folks that want to give you another place to go in the evenings and spend a few bucks, They are NOT part of the Turkey Run and cannot sell event souvenirs or tickets. Can I put a For Sale sign on my vehicle in the Show Car field? No, not until the Car Corral and Swap Meet sells out. We will announce when the Car Corral and Swap Meet sells out and then you will be able to display your sign. If you really want to sell your car, take it to the Car Corrall. There are serious buyers there! Why do I need a special sticker to be in the Car Corral? The Turkey Run Car Show is a separate event from other events at the Turkey Run. 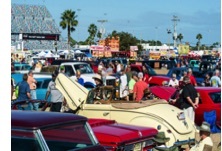 You will need a separate registration sticker for the Car Corral, Swap Meet or Artisan Alley. What is included with my Swap Meet or Car Corral space? Single space packages include one (1) Vendor Pass Decal, admission tickets for 2 adults per space (for vendor to enter) and a Gate Decal that designates the gate you are to enter each day. One (1) Support Vehicle Pass is available for $10. Multiple space packages include one (1) Vendor Pass Decal for every two (2) spaces purchased, admission tickets for 2 adults per space (for vendor to enter) and a Gate Decal that designates the gate you are to enter each day. One (1) Support Vehicle Pass is available for $10. Additional admission tickets may be purchased if necessary. May I stay the night? Registered vendors may purchase a self contained RV space. RV spaces are assigned in advance. Please contact 386-255-7355 for pricing. Vendors with RV’s must get an overnight parking ID card from Registration BEFORE 4pm the day of arrival. RV’s can stay overnight the first day of set up through 10am Monday. Please do not run generators during “Quiet Time” from 11pm - 6am. No tent camping or sleeping in vehicle. Why do I see so many people on mobility scooters that look like they don't need them? The ADA (Americans with Disability act) prohibits discrimination against people with disabilities in employment, transportation, public accommodation, communications, and governmental activities. The law states that we CANNOT ask the type of disability of a person of any age that wants to rent a scooter. 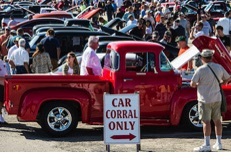 All registered Car Show PARTICIPANTS are allowed to bring their car and contents into the Speedway infield. Four passengers max per car please. Additional "walk in" passes are included with your registration package to allow participants to walk in and out of the speedway during the show. Reserved Club Parking means that your club has reserved a group of spaces in advance and has a reserved location with your club's name on it. This enables your club to park together in the infield. All other participants park in the infield on a "first come-first served" basis. If your club didn't pre-reserve a spot, don't worry! You will park in the same infield as everyone else. As a Car Show participant, do I have to be there every day? Can I come and go as I please? You have complete control over what you do at the Turkey Run. You can be there as many or as few days as you please. You can come and go as many times as you want, but you must exit during the day through the east tunnel. You can leave your car inside the Speedway overnight but you must remove it by Monday at noon. Vendors are required to participate each day of the event. If I register my '34 Ford but it's not ready, can I bring a different vehicle instead? Support vehicles are NOT allowed in the infield area. Trailered cars are not allowed to unload inside the “car show” section of the speedway. If your vehicle doesn't run you will have no way to get it inside the speedway unless you bring a bunch of strong friends. You can now drop off your trailer and tow rig at gate 70, (9am to midnight). On show days, dropoff is at gate 60 from 7am to 3pm and gate 70 from 4pm to midnight . Trailer parking is $30.00 for the Spring show and $40.00 for the Fall show. All vehicles must be removed from the speedway by noon the following Monday after the show. If I purchase some heavy parts at the Swap Meet, how can I get them out of the speedway? Special golf carts are available throughout the swap meet area. Please call 386-681-4284 for Vendor dispatch and a parts hauler will be dispatched to your location.